Explanation: Few auroras show this level of detail. Above, a standard digital camera captured a particularly active and colorful auroral corona that occurred last week above Alberta, Canada. 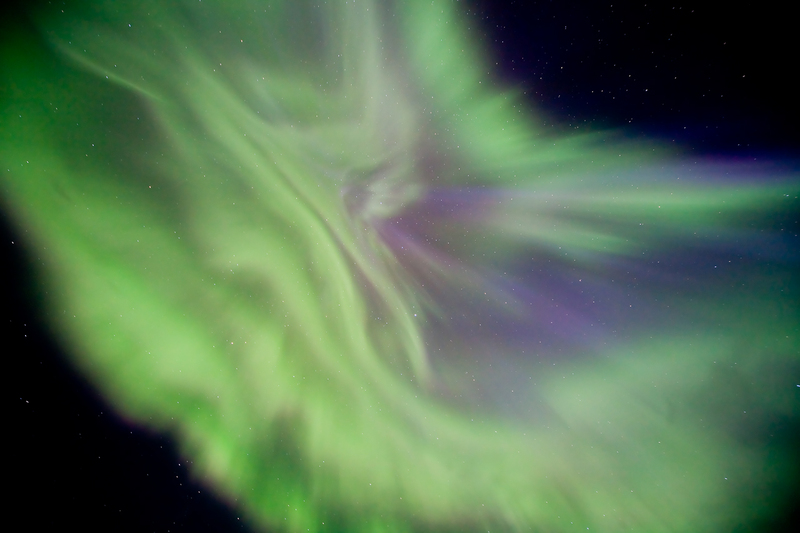 With a shape reminiscent of a flower, the spectacular aurora had an unusually high degree of detail. The vivid green and purple auroral colors are caused by high atmospheric oxygen and hydrogen reacting to a burst of incoming electrons. Many photogenic auroras have been triggered from a solar wind stream that recently passed the Earth. The auroras were unexpected because the initiating Sun has been unusually quiet of late. Note: An APOD editor will review great space images this Saturday night at Ft. Wilkins, Michigan.